Trouses always get dirty while cycling? This chainring guard can prevent your trousers getting dirty from chian oil while cycling. Please make sure if the dimensions of your crank set is applicable to this cover and make sure if your crank ring has 4 screw holes. 1. CLASSIC DESIGN: This crank ring protector is lightweight with simple and classic design. 2. CHAINRING PROTECTOR: Give your crank ring a good protection, and prevent your clothes get dirty at the same time. 3. FITMENT: Suitable for 44T Chain Wheel, like Shimanos M430, M590, M390. 4. EASY TO INSTALL: Provided with screws and gaskets, easy to install. 5. Great acessory for your chain wheel. 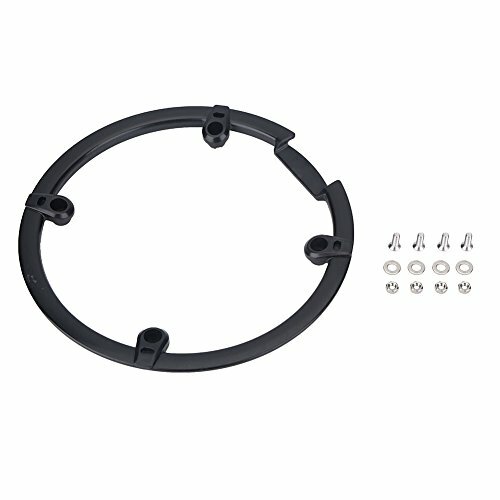 CLASSIC DESIGN: This crank ring protector is lightweight with simple and classic design. CHAINRING PROTECTOR: Give your crank ring a good protection, and prevent your clothes get dirty at the same time. FITMENT: Suitable for 44T Chain Wheel, like Shimanos M430, M590, M390. EASY TO INSTALL: Provided with screws and gaskets, easy to install.